Nearly two-thirds of public secondary schools in the United States (65%) had sworn law enforcement officers on site in the 2015-16 school year, up from 58% a decade earlier. Yet the presence of sworn officers varied considerably by factors including school size and the specific times the officers were present, according to a March report by the Bureau of Justice Statistics and the National Center for Education Statistics. The report comes amid heightened attention to school security following the February mass shooting at a high school in Parkland, Florida. The shooting, which left 17 people dead, has led to protests and school walkouts around the country. It has also sparked discussions about policy responses to prevent school shootings, including proposals to let teachers carry firearms. While the presence of sworn officers at secondary schools has become more common over the past decade, many schools report that these officers were only present at specific times rather than throughout the entire school day, according to the report (data are for the 2015-16 school year, the most recent available). Secondary schools include middle and high schools, as well as combined schools. Less than half (46%) of secondary schools with sworn law enforcement officers present at least once a week had officers present for all instructional hours every day; larger shares of schools said officers were present when students were arriving or leaving (88%) or at selected school activities (87%), such as science fairs or athletic events. The presence of sworn officers on school grounds also varied by school size, as well as the racial and ethnic composition of the student body. Larger secondary schools were particularly likely to report the presence of sworn officers on their school grounds. Nine-in-ten schools with 1,000 or more students reported the presence of sworn officers at school, compared with 72% of schools with 500 to 999 students, 59% of schools with 300 to 499 students and 34% of schools of less than 300 students. Secondary schools with the largest shares of nonwhite students were more likely to report having sworn officers on site than schools with the smallest shares of minorities. Nearly seven-in-ten schools (69%) where at least half of the students are racial or ethnic minorities reported having sworn officers at school at least once a week. That compares with 56% of schools where less than 5% of the student body is nonwhite. Over the past decade, secondary schools in which less than 5% of students are nonwhite saw the largest percent increase in sworn officers reported on site (up 53%, compared with a 12% increase among secondary schools overall). Sworn law enforcement officers routinely carried a firearm in the vast majority (93%) of U.S. public secondary schools where such officers were present, according to the report. In the main report survey, 6% of high schools and 3% of middle schools reported taking at least one disciplinary action for the use or possession of a firearm or explosive device during the 2015-16 school year. 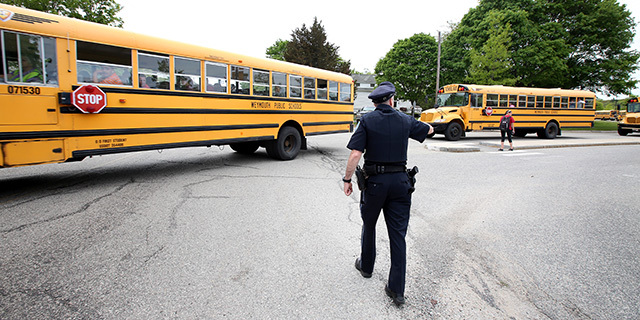 Many schools reported being actively prepared for several crisis scenarios, including shootings. Vast majorities of both middle (94%) and high schools (95%) had written procedures to be performed in a shooting scenario, up from around 86% each for middle and high schools in 2003-04. A majority of U.S. teenagers today worry that a shooting could happen at their school (57%) and many parents of teens share that concern (63%), according to Pew Research Center surveys conducted in March and April. 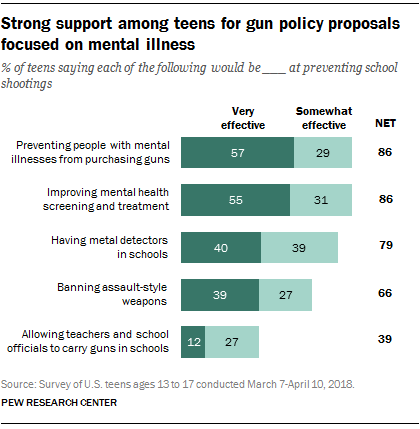 Large majorities of teens say that preventing people with mental illnesses from purchasing guns and improving mental health screening and treatment – 86% each – would be at least somewhat effective at preventing school shootings. Roughly eight-in-ten teens (79%) say that having metal detectors in schools would be effective and 66% say the same about banning assault-style weapons. Correction: In a previous version of this post, the second chart gave an incorrect end date for the period during which parents and teens were surveyed. The survey ended April 10.